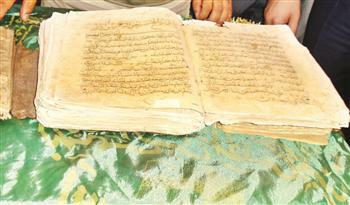 The Qur’an copy was handed to Bodrum Underwater Archaeology Museum in a ceremonial event. Preserved for centuries in a prayer rug, a 1200 year–old handwritten Qur’an and tafsir books have been found in a Turkish mosque in Muğla province in the southwestern Aegean Region of Turkey. “We did not give it any importance thinking that it was an ordinary Qur’an,” Yüksel Kılınçarslan, the imam of Tepecik Mosque where the Qur’an was found, told Anadolu Agency reported on Monday, September 16. Located in Aegean resort town of Bodrum, Tepecik Mosque has been the local since 1737. Earlier this month, the 1200-year-old handwritten Qur’an was found in the basement of Tepecik Mosque in Turkey’s Bodrum district in Muğla province rolled in a prayer rug. After a series of examinations by historians, it has been confirmed that the Qur’an dated back more than a thousand year. 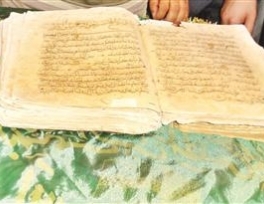 After informing Bodrum’s Mufti Emin Arık, the Qur’an copy was repeatedly examined by historians, who found that the Qur’an dated back for more than a thousand year. “I went to Ankara to talk to officials and they asked me to give it to the relevant institute.” Kılınçarslan said. Officials said that the handwritten Qur’an will be sent to a manuscript library in İzmir after undergoing some maintenance. The Qur’an was revealed to Prophet Muhammad (peace and blessings of Allah be upon him) through the archangel Gabriel who used to make the Prophet (peace and blessings of Allah be upon him) memorize the Qur’an and made him revise it every year in the month of Ramadan, the fasting month. Fragments from a large number of Qur'an codices were discovered in Yemen in 1972. They are now lodged in the House of Manuscript in Sana'a. Tests date some of the parchments to 645–690 AD, however, archeologists said that calligraphic datings have pointed to 710–715 AD. One of the three Qur'ans attributed to Uthman (may Allah be pleased with him), the Samarkand Kufic Qur’an is preserved at Tashkent. It is believed to be of a date between 595 CE and 855 CE.